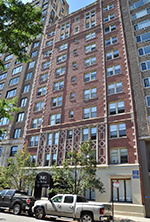 2140 is a vintage 11-story high rise located directly across the street from the Lincoln Park Zoo. The building sits in the heart of Lincoln Park one of the most dynamic neighborhoods in Chicago, offering a wide array of shopping, theaters, and nightlife. The building's stunning views, immediate access to the park and lakefront, and many apartment amenities including a fitness room make 2140 Lincoln Park West a great place to call home.